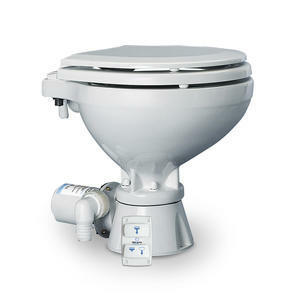 Silent electric compact toilet with seperated flushing and waste disposal cycle. Including electronic 3 function control panel, before use, after use and short use plus a trimmer to regulate the flow rate. Water is from existing pressurized water system onboard with 24V solenoid valve (PN 07-66-031) or 24V flush pump (PN 07-66-033)- not included! Silent operation and low water consumption. Easy to clean white ceramic bowl and white wooden seat. Port conections inlet 19mm (3/4"), outlet 25mm or 32mm (1" or 1,5"). 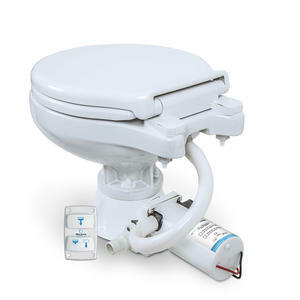 Stable base for robust installation, plug & play/ interchangeable with Jabsco 37045-0094, Johnson Pump 80-47231-02 and other 24V dual cycle electrical toilet models.